Product prices and availability are accurate as of 2019-04-10 12:02:04 EDT and are subject to change. Any price and availability information displayed on http://www.amazon.com/ at the time of purchase will apply to the purchase of this product. Everyone has a beautiful house in them. Discover yours with the amazing new House Beautiful Home Design Suite. Integrated design tools allow you to master a wide variety of projects from interior design to complete home remodeling, all at the click of a mouse. Envision your home in 3D with incredible tools like fly-throughs and doll house views. Want to remodel your kitchen or bath? House Beautiful Home Design Suite makes it easy to transform your kitchen or bath into the room of your dreams. The Cabinet Wizard allows you to create custom cabinetry to fit any space. Drag-and-drop tools allow you to add appliances, flooring and counter tops to envision your room’s true potential. Try wall paper or paint to find a style that is uniquely yours. Looking to give your home a face lift? One-click decorator palettes allow you to change or update the look and feel of a room at the click of a mouse. Try new furniture, window treatments or lighting. Add a skylight or bay window. Envision your entryway with wood floors or marble tile. The possibilities are endless. Want to improve your curb appeal? Curb appeal isn’t just a buzz word; it’s the key to improving your home’s value! 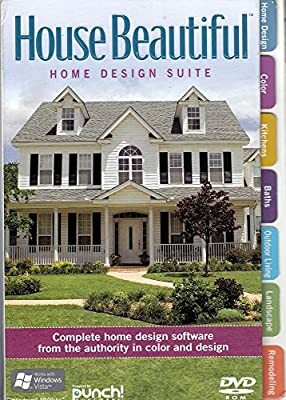 House Beautiful Home Design Suite allows you to try new doors and windows, remodel your landscape and change the color of your home, all without opening a can of paint. Add a new porch, patio or deck with the incredible Deck Wizard. Give your landscape the edge it needs by planting zone-friendly varietals. PlantFinder will help to ensure your success by letting you select growing parameters, climate, water and soil conditions. Get the right plant height and spacing for your home using the Automatic Growth Tool which allows you to see how your landscape will look years from now.